From the Uniformed Services University of the Health Sciences, Bethesda MD. Plantar fascia rupture in the absence of previous diagnosis of plantar fasciitis, corticosteroid injection, or injury is a rare occurrence with only 7 case reports in the literature since 1978. This is a case of spontaneous plantar fascia rupture in a 38-year-old active-duty US military member with current considerations in musculoskeletal ultrasound, other radiologic imaging, treatment, and followup of this diagnosis. 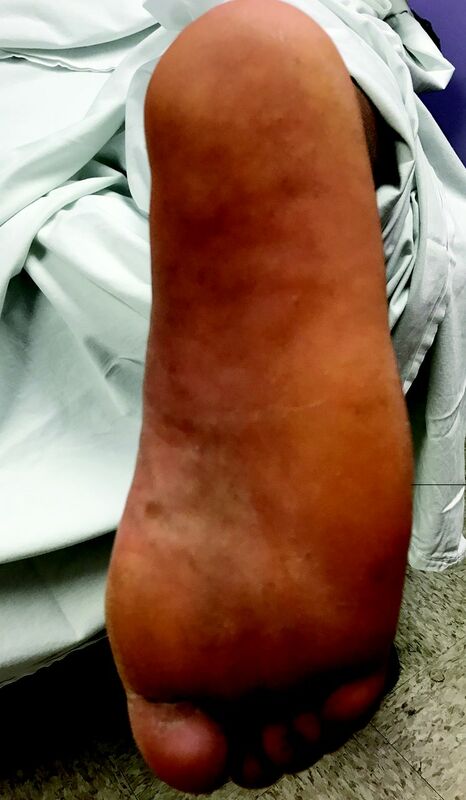 A 38-year-old previously healthy active-duty male member of the US Armed Services presented to a family medicine clinic for evaluation of severe right heel and plantar midfoot pain of less than 24 hours' duration. The patient reported that while going up for a layup shot during a basketball game, he experienced a “pop” and immediate pain in his left foot localized at the front and middle part of his heel. He was able to finish the remaining 30 minutes of the game but continued to have pain that caused limping the remainder of the game. Afterward, he self treated with ice, elevation of his foot, and an unspecified nonsteroidal anti-inflammatory medication (NSAID). Two days later when his symptoms, foot pain and limping, persisted with minimal improvement despite these home treatments, he presented to clinic for evaluation. As a military medic himself, the patient provided a thorough medical history that included having no previous heel pain, diagnosis of plantar fasciitis, footwear or activity changes, minimalist footwear, or trauma. On further questioning, he denied ever having had corticosteroid injections or fluoroquinolone use. On inspection his examination was remarkable for an antalgic gait, without pes planus or cavus. His foot demonstrated some mild swelling, tenderness, and ecchymosis in the mid-plantar foot (Figure 1). Tenderness to palpation was noted extending from the medial calcaneal tubercle distally 3 cm. Ottowa Ankle and Foot Rules were negative including no tenderness to palpation at the posterior medial or lateral malleoli, base of the fifth metatarsal, or the navicular bone. His Achilles tendon was nontender with an intact extensor mechanism based on Thompson test, and later confirmed with ultrasound. Active range of motion was normal in all planes, and his deep tendon reflexes at the Achilles tendons were normal. His muscle strength testing, including flexor and extensor hallicus longus, flexor and extensor digitori, tibialis anterior and posterior as well as fibularis longus and brevis, gastrocnemius and soleus, were all 5/5 and symmetric with the unaffected foot. Neurovascular examination demonstrated normal sensation to light touch over the entirety of the foot and ankle, capillary refill was less than 1 second, and the dorsalis pedis and posterior tibial pulses were symmetric with the unaffected foot. Special testing including anterior drawer, talar tilt, squeeze, Thompson were negative. Plain x-rays of the ankle and foot were negative for fracture or other clinically relevant findings. The patient was diagnosed with a likely plantar fascia rupture, placed in a rigid controlled ankle movement (CAM) walker boot for comfort and use when on his feet but not at rest or while showering. He was directed to continue with NSAIDs for swelling and inflammation, rest and ice for pain, and referred to a family physician with sports medicine fellowship training. Right heel with ecchymosis and mild swelling in the mid plantar foot. The following day he was seen by a family physician with fellowship training in sports medicine who performed bedside ultrasound that demonstrated partial rupture of the proximal plantar fascia without hematoma and an intact Achilles tendon. To assess for additional potential injuries, such as spring ligament rupture or occult fracture, an magnetic resonance imaging (MRI) was performed confirming partial tear of the medial and central bands of the plantar aponeurosis. The patient was treated nonoperatively with continued CAM walker boot use for comfort when on his feet and not showering, along with no barefoot walking, NSAIDs, ice, and weekly followup. Telephone consultation with an orthopedic surgeon was obtained to assess whether surgical intervention was warranted. All involved, including the patient, agreed that nonsurgical care was best. Bruising resolved and NSAID use was stopped 2 weeks after injury. Due to patient preference, the CAM walker boot was worn for 2 weeks total and graded return to activity began including advancement from rest until pain free, then introduction of stretching of the foot and ankle soft tissues and with the goal of full pain-free return to activity. For comfort he wore a commercial ankle sleeve and performed home stretching. The patient was pain free with return to full activity 5 weeks after injury. Plantar fascia rupture, an uncommon occurrence, was first described in 1978.1 Known risk factors include prior plantar fasciitis2⇓⇓–5, minimalist running6, and corticosteroid injections.2⇓⇓–5 Fluoroquinolone use could also be a risk factor in the authors' opinion; however, this has not been proven in any medical literature to date. After a corticosteroid injection the risk of plantar fascia rupture has been reported to be 2.4% to 10%.2,7 The most common precipitating events leading to plantar fascia rupture include sudden jumping, running, and even minimal sprinting in the nonathlete.2,5⇓⇓–8 Sports most frequently associated with plantar fascia rupture include basketball, soccer, running, and tennis.1,4⇓–6,8⇓⇓⇓⇓–13 It has been described in dancing, football, and badminton.14⇓–16 The age range for this injury is 18 to 72 years.4,17 Patients usually report a “pop” with immediate pain near the medial calcaneal tubercle. Despite this, patients can often finish their activity but pain persists. As in this patient, bruising, swelling, and tenderness to palpation are seen on examination of the medial plantar surface of the affected foot. Concomitant injury to the Achilles tendon must be assessed for and treatment adjusted if present, even if the exact likelihood is unknown. Spontaneous rupture of the plantar fascia, defined as having no prior foot risk factors, is rare. Only 7 definitive spontaneous ruptures have been reported in the literature1,6,9,10,12,15,16, although there may have been others embedded in case series not conclusively specified. Our patient will make the eighth case reported since 1978. Initial imaging should include plain radiography to assess for fracture. Although not present in our patient, calcaneal spurring is an exceedingly common and incidental plain film finding and in most instances is not the culprit nor an indication for surgical treatment. If available, a next step is bedside musculoskeletal ultrasound as this is becoming more commonplace and useful.9 MRI remains the current standard for diagnosis of ligamentous or fascia tear if clinical suspicion remains elevated and initial imaging has been equivocal. There are some potential long-term consequences of plantar fascia rupture, regardless of whether the patient had risk factors. Patients can develop lifelong alteration of foot mechanics leading to midfoot strain and long-term pain2, increased incidence of stress fractures, hammertoe deformity swelling, or dysfunction of the lateral plantar nerve.2 Complete understanding of lifelong effects have not been determined. Heel pain is a common complaint with numerous insidious and chronic causes. Plantar fasciitis is the most common cause of plantar heel pain, and accounts for 11% to 15% of all foot concerns in adults who seek medical attention.13,18,19 Plantar fasciitis is often a chronic condition with fluctuations of symptoms. Even though the initial treatment is similar with plantar fasciitis and plantar fascia rupture, patients with a rupture typically have resolution of symptoms within weeks to months, Therefore, defining the diagnosis is critical in the counseling and management of the patient. In addition, acute heel pain often is trauma related and diagnoses could include fractures, spring ligament tear, or very rarely injury to the medial calcaneal nerve. Plantar fascia rupture should be included in the differential diagnosis of anyone with acute severe plantar pain, swelling, and ecchymosis associated with sudden running or jumping motions, and those with the known risk factors of plantar fasciitis and heel corticosteroid injections. Even though MRI is the standard for diagnosis, point-of-care ultrasound is becoming a common adjunct for making the diagnosis. There are currently no studies comparing these 2 modalities. It is possible this is more common than is discovered and diagnostic reasoning with cognitive biases may be leading to under diagnosis. Thank you to the patient for allowing us to use his case to further medicine. Disclaimer: This work represents the opinions of the authors only and does not reflect the opinions of the US Air Force, the Uniformed Services University of the Health Sciences, or the Department of Defense. To see this article online, please go to: http://jabfm.org/content/31/2/282.full. Received for publication July 5, 2017. Revision received October 18, 2017.
. Rupture of the plantar fascia in athletes. J Bone Joint Surg Am 1978;60:537–9.
. Complications of plantar fascia rupture associated with corticosteroid injection. Foot Ankle Int 1998;19:91–7.
. Risk factors affecting chronic rupture of the plantar fascia. Foot Ankle Int 2014;35:258–63.
. Plantar fascia ruptures in athletes. Am J Sports Med 2004;32:662–5.
. Plantar fascia rupture associated with corticosteroid injection. Foot Ankle Int 1994;15:376–81.
. Injuries observed in minimalist runners. Foot Ankle Int 2012;33:262–6.
. Incidence of plantar fascia ruptures following corticosteroid injection. Foot Ankle Spec 2010;3:335–7.
. Spontaneous rupture of the plantar fascia. Am J Sports Med 1998;16:306–7.
. Ultrasound evaluation of a spontaneous plantar fascia rupture. Am J Phys Med Rehabil 2010;89:941–4.
. Rupture of the plantar fascia in a middle-aged tennis player. A case report. Am J Sports Med 1983;11:95.
. Plantar fascia rupture in a professional soccer player. J Med Invest 2014;61(3–4):413–6.
. Sequential bilateral rupture of the plantar fascia in a tennis player. Sports Med 1994;84:137–41.
. Clinical characteristics of the causes of plantar heel pain. Ann Rehab Med 2011;35:507–13.
. Acute plantar fascia rupture in a dancer. J Dance Med Sci 2004;8:116–7.
. Plantar fascia rupture: Diagnosis and treatment. J Foot Ankle Surg 1997;36:112–4.
. Spontaneous rupture of the plantar fascia. Clin J Sports Med 1999;9:48–9.
. Rupture of the Plantar Fascia. J Foot Ank Surg 1996;35:39–40.
. Clinical practice. Plantar fasciitis. N Engl J Med 2004;350:2159–2166.
. Diagnosis and treatment of foot conditions. AAFP 2016 Comprehensive: A board preparation tool. Available from: http://www.aafp.org/test/fpcomp/FP-E_379/pt1-s1.html. Accessed October 6, 2017.